In a time when home studios and portable studio setups are becoming more and more popular and available, it’s always tricky to find the right gear when you decide to upgrade in a big way. That’s the problem I run into when it came time to decide; what to buy! I run sound for the God’s Embassy Church (Edmonton, Alberta), as well as doing a regular praise and worship set for College Heights Church (Lacombe, Alberta) among other things. Being a musician as well, I love to record every chance I get. Whenever my group does praise and worship at College Heights, I plug in to record. It was during this phase that I found out about Antelope Audio, and their relatively new Zen Studio. Typically, it’s wiser to shy away from very new technology, as it comes with all its quirks and problems. 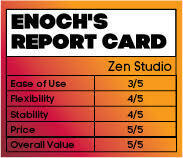 But seeing the Zen Studio, and all the features it offers, I couldn’t help but be curious. That being said, I sucked it up and took it on. At $2800, it’s not exactly the cheapest available interface. Being such a small company, I had to wait for mine to be shipped out to Edmonton, and then pick it up. I couldn’t wait! As soon as it arrived, I jumped right into it. Straight off the bat, I have to say, it is beautiful. Holding it in my hands, it feels tough, built like a tank. It’s surprisingly light for its size, and has a relatively small footprint. Within weeks, I had put it through its paces, trying it out in various scenarios and environments. From a simple pre-recorded radio show to a full on church concert, it completely blew me away. 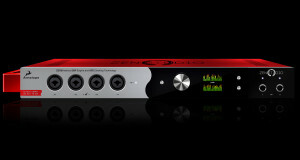 Software Antelope Audio uses a matrix type proprietary software for all the routing done on the Zen Audio. It’s very powerful, allowing you to select four different mixes, and well as a wealth of connection choices. With the built in mixing options, you can adjust the volumes for each input/output choice, as well as adjusting the two headphone outs, monitor volume, and the gain of individual preamps. The Zen Studio comes advertised with 12 preamps, four of which are Hi-Z inputs for guitar. The cool thing in the software for these front four is with the click of a button, you can determine if the input is a Line In, Mic, or Guitar. As well, there is 48v phantom power for each preamp, as opposed to the more commonly used global phantom power. The downside to this powerful software is twofold: the learning curve (as well as the limited resources for learning it), and it’s newness to the market. It’s not terribly difficult, but it takes some fishing around to figure it out. The great thing is, to counter this, you can call Antelope Audio directly for help, both software related and hardware (i.e. connections and such). Being such a new combination, it has its quirks. To date, I’ve only had one incident in which the software failed to connect properly with the hardware, and a few random instances of other artifacts present in the signal path that did not come from the equipment being used. A quick restart of both the software and hardware dealt away with these immediately. On the plus side, Antelope Audio has promised (and followed through) with regular updates to the firmware. In my view, it can only get better. Hardware First, and foremost, the coolest feature is one that doesn’t seem like a big deal initially: built into its body is a handle. This comes in so handy when you decide to go mobile. Arrive, pull out of backpack, and voila!, plug and play. Also built into it are 12 preamps, as well as an additional eight analog ins and outs. This makes connectivity very diverse and flexible, without even touching on the variety of digital connections. Each of the preamps is very clean, and I’ve heard them compared to Neve pres in several reviews. In my opinion, they sound comparable, and are incredibly transparent. Unlike Neves and the Pioneers, they don’t have their own color, but they do present a clear picture of the sound coming through. The D/A conversion is also incredible. Jumping from a $500 interface to this magnificent piece of gear really shows, and in this particular case, the Zen Studio sounds amazing! I could hear things I hadn’t heard before, and the transients were so clear. For the first two months, I would not leave home without it. Also at the front, Antelope Audio keeps things simple by limiting the number of buttons. Using the single monitor dial, a highly visible multi-coloured LCD, and two buttons immediately adjacent, you can control everything from screen brightness to individual preamp gain levels, among so many other things. It’s safe to say once setup, you only need open the software to adjust individual mixes and for routing purposes. Versatile, but simple. After all, no engineer likes clutter on the job. The only problem I could find with it is one that is common with quite a few pieces of high end audio gear. Used, or left on over prolonged periods, it heats up pretty quickly, perhaps enough to fry an egg on. I haven’t tried it, and I don’t recommend it either! Overall I was excited when I first heard about it, and am still very excited as more updates come in. It’s an incredible addition to the engineer’s arsenal. On the go, it allows incredible mobility, while packing an incredible hulk type punch in power and features. In the HOW, it’s very versatile, allowing you to tie into the main mixer and record the entire program, with ease. I’ve used it to record sermons, praise and worship sets, and full blown concerts. Each time, it’s come through in an incredible way. I wouldn’t trade it for anything, and I can promise this will be the hub of my operations for a while to come.